Steel tariffs are now in place, and the world is grumbling and threatening retaliation against the US. Its closest partners, such as Canada, are trying to figure out how to navigate the waters. Part of Corporate America is lobbying against it and wagging its checkbook. The other part of Corporate America — the part that has been lobbying for it — is now grinning from ear-to-ear. And the media is steeped in this melee. 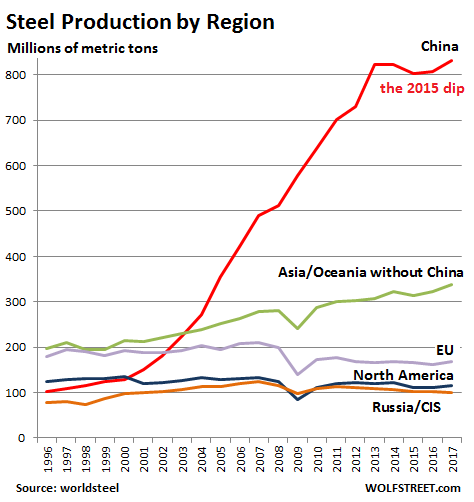 But just who is producing all this steel, and who is dominating this trade? In April, China’s crude steel production rose 4.8% from a year ago to 76.7 million tonnes (Mt), the highest on record, according to the World Steel Association. This was nearly 11 times as large as the 6.9 Mt of crude steel that the US produced. China’s production was nine times as large as that of the second and third largest producers, Japan and India, each with 8.7 Mt. World production of crude steel in April was 148.3 Mt, of which China’s share was 51.7%. 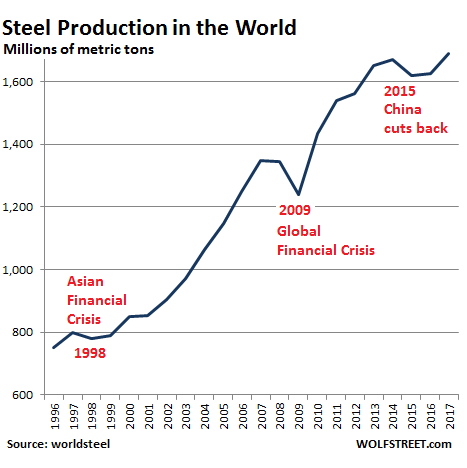 And with somewhat awkward timing, the World Steel Association, whose members represent approximately 85% of the world’s steel production, just released its World Steel in Figures 2018, with data through 2017. So here we go, step by step. Steel production has grown sharply over the years. Since 1996, there were only three years when production declined: In 1998, as a result of the Asian Financial Crisis, in 2009 as a result of the Global Financial Crisis, and in 2015, when China made a short-lived effort to get a grip on its rampant overproduction. So how big of a role does China play in this? To continue reading: The Global Steel Trade that Trump Just Hit with Tariffs? With Peter Navarro egging him on, and a handful of US steel and aluminum producer CEOs patting him on the back, President Trump’s decision to impose tariffs has prompted worldwide outrage from the establishment as a sign of impending trade wars and the end of the world as we know it. While many are purely political kneejerk reactions – just as anything Trump does is a negative (think “crumbs”) to those on the ‘other’ side – The Editorial Board at The Wall Street Journal, believe that Donald Trump made the biggest policy blunder of his Presidency Thursday by announcing that next week he’ll impose tariffs of 25% on imported steel and 10% on aluminum. This tax increase will punish American workers, invite retaliation that will harm U.S. exports, divide his political coalition at home, anger allies abroad, and undermine his tax and regulatory reforms. The Dow Jones Industrial Average fell 1.7% on the news, as investors absorbed the self-inflicted folly. Mr. Trump has spent a year trying to lift the economy from its Obama doldrums, with considerable success. Annual GDP growth has averaged 3% in the past nine months if you adjust for temporary factors, and on Tuesday the ISM manufacturing index for February came in at a gaudy 60.8. American factories are humming, and consumer and business confidence are soaring. Apparently Mr. Trump can’t stand all this winning. His tariffs will benefit a handful of companies, at least for a while, but they will harm many more. “We have with us the biggest steel companies in the United States. They used to be a lot bigger, but they’re going to be a lot bigger again,” Mr. Trump declared in a meeting Thursday at the White House with steel and aluminum executives. No, they won’t. The immediate impact will be to make the U.S. an island of high-priced steel and aluminum. The U.S. companies will raise their prices to nearly match the tariffs while snatching some market share. The additional profits will flow to executives in higher bonuses and shareholders, at least until the higher prices hurt their steel- and aluminum-using customers. Then U.S. steel and aluminum makers will be hurt as well. Mr. Trump seems not to understand that steel-using industries in the U.S. employ some 6.5 million Americans, while steel makers employ about 140,000. 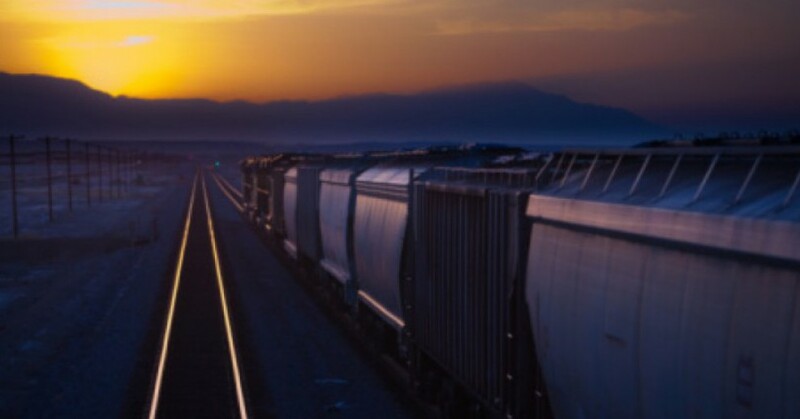 Transportation industries, including aircraft and autos, account for about 40% of domestic steel consumption, followed by packaging with 20% and building construction with 15%. All will have to pay higher prices, making them less competitive globally and in the U.S.
an eerie analogue of what is about to take place, on March 5, 2002 President George W. Bush imposed tariffs as high as 30% on global steel imports. 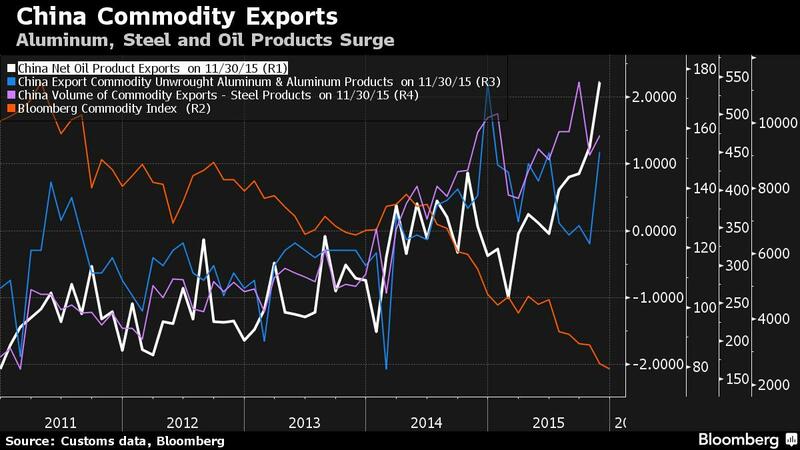 There’s no let-up in the onslaught of commodities from China. While the country’s total exports are slowing in dollar terms, shipments of steel, oil products and aluminum are reaching for new highs, according to trade data from the General Administration of Customs. That’s because mills, smelters and refiners are producing more than they need amid slowing domestic demand, and shipping the excess overseas. The flood is compounding a worldwide surplus of commodities that’s driven returns from raw materials to the lowest since 1999, threatening producers from India to Pennsylvania and aggravating trade disputes. While companies such as India’s JSW Steel Ltd. decry cheap exports as unfair, China says the overcapacity is a global problem.